The spring walleye run is in full swing. Limited openings available. Salmon, Steelhead & Lake Trout season starts mid May. 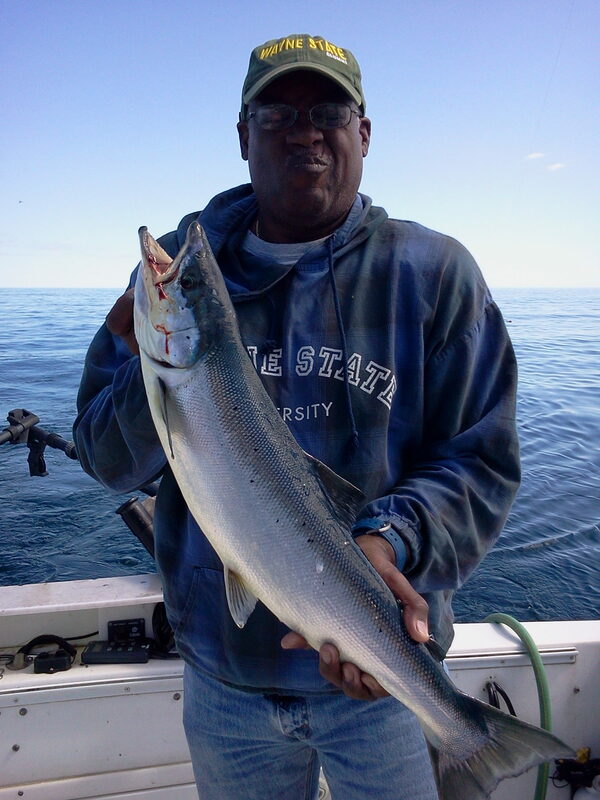 Great Lakes Fishing Charters LLC (GLFC) has over 20 years of chartering experience. Are moto over the years has been to “Follow the Fish”. This season we will be fishing for: Walleye on the Detroit River and St. Clair River; Salmon, Steelhead and Lake Trout on Lake Huron; Musky, Perch, Smallmouth Bass, and Walleye on Lake St. Clair. As you scroll down thru our PORTS and charter dates, you will see that we are at the “Prime” locations at the preferred times of the year for each species of fish you want to catch. Currently, the Walleye population on Lake Huron, the St. Clair River, and Detroit River is at record numbers. So,…GLFC fishes the spring Walleye run in April, May and June where the fishing has been incredible. The Detroit River turns on first every spring with April being the premier month. As the weather warms in April the Walleye continue north to the St. Clair River. By early May the Detroit River is still good but, the St. Clair River has more walleye than the Detroit River. May and June are “Prime Time” to fish for Walleye on the St. Clair River. Walleye remain in the St. Clair River in huge numbers well into summer. More time may be added to our schedule to take advantage of the summer Walleye fishing on the St. Clair River and southern Lake Huron. Don’t miss the Walleye fishing on the Detroit River and St. Clair River. It is world class! By May the Atlantic Salmon, Coho Salmon, King Salmon, Pink Salmon, Steelhead and Lake Trout fishing is also good from Port Sanilac Lake Huron. The Atlantic Salmon fishery continues to grow and is a great addition to the other Salmon and Trout we catch from Port Sanilac. 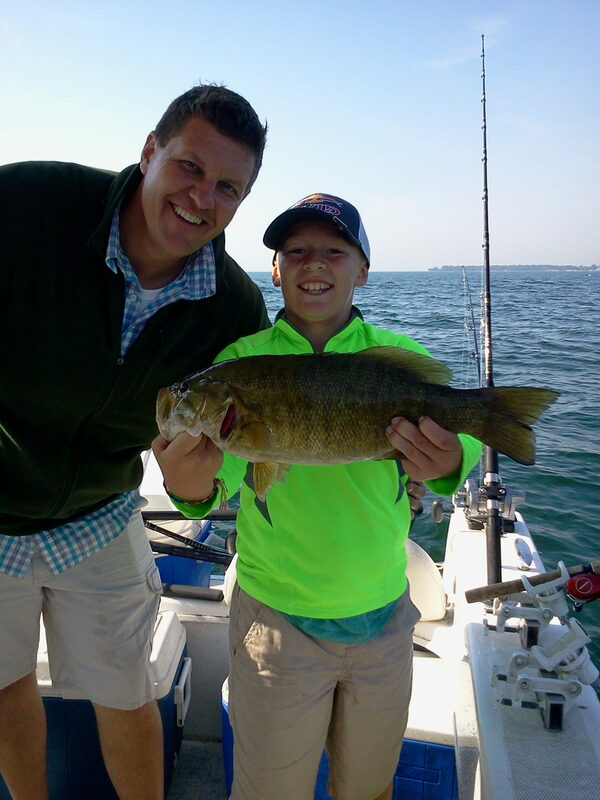 Summer time boasts “World Class” Musky and Smallmouth Bass fishing on Lake St. Clair followed by the fall Perch fishing on Lake St. Clair. Enjoy reading about the many charter option we offer for your fishing pleasure. Please call to check available dates and to reserve your charter. 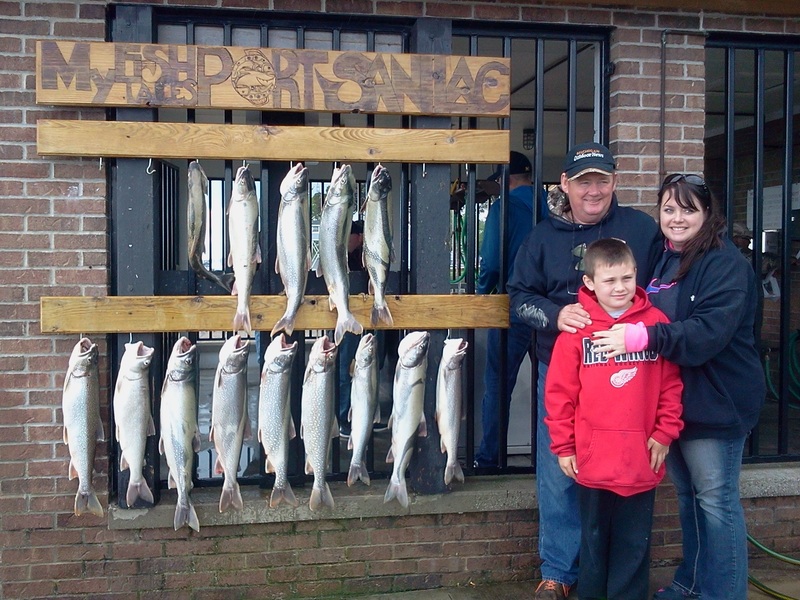 The Detroit River is the preferred location to fish spring walleye in April and Early May. These are the preferred weeks out of the entire year. The Detroit River is known nationwide for incredible spring walleye fishing. By early April the walleye run is in full swing regardless of the weather above water. The increasing length of day and incremental increase in water temperature triggers the walleyes spawning cycle. April and early May see the peak run on the Detroit River each year. Come early May most of these walleye are on the move north to the St. Clair River. The walleye population is at an all-time high thanks to several back to back years of near record spawning success. 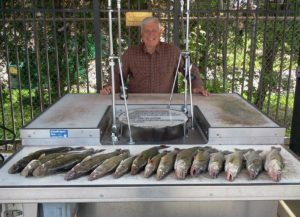 Plan to fish the Detroit River in April or early May. 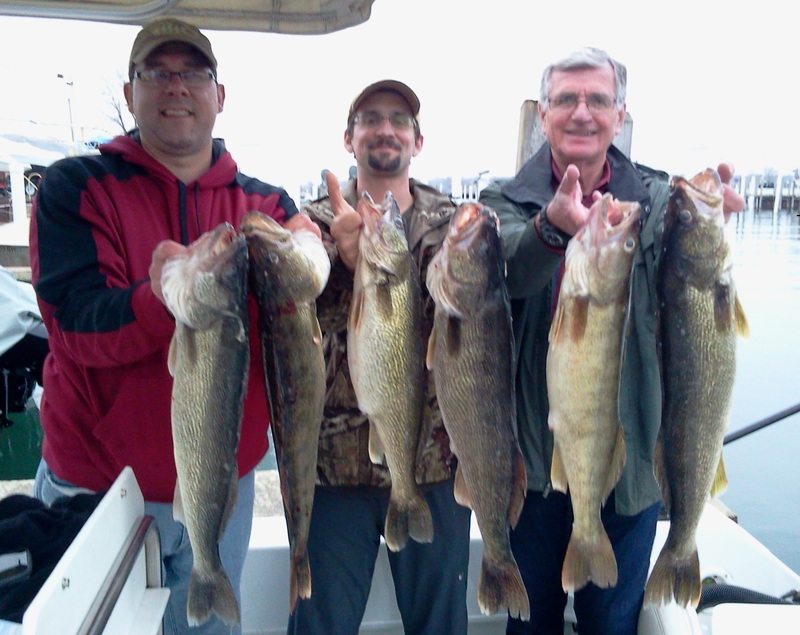 The St. Clair River is the preferred location to fish the spring walleye run in May and June. The walleye fishery expands and changes as spring progresses toward summer. Vast numbers of the walleye that started out in the Detroit River now move north to find their preferred water temperature in the St. Clair River where they will join the millions of walleyes already in the St. Clair River. 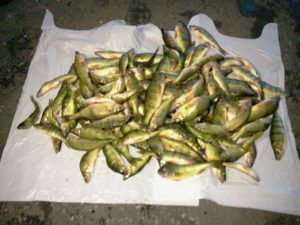 The driving factor at this time of the year becomes water temperature and the abundance of minnows in the St. Clair River. Why the difference between the St. Clair River and Detroit River? As water flows from deeper colder Lake Huron to the St. Clair River, then to much shallower Lake St. Clair and finally the Detroit River the water warms up at a much faster rate in shallower Lake St. Clair. Since Lake St. Clair feeds the warmer water to the Detroit River it is both a blessing and a curse. After “ice out” in March this warming is a benefit for the Detroit River, however by early May this increased rate of warming pushes the walleye north to the St. Clair River to find cooler (preferred) spawning temperatures for many more weeks. What determines where our boats are docked for the spring walleye run? It’s all about the quality of the fishing. The amenities at the marinas are then reviewed to find the nicest facility available. The Detroit River has many marinas and boat launches which is good and bad news. The “downriver” sections of the Detroit River have more boat launches. Boat traffic “downriver” can be extreme and take much of the fun out of a day on the water. The Upper Detroit River has less boat traffic due to the limited number of boat launches and marinas. The water quality, lighter boat traffic and the abundance of gravel for spawning walleye make the middle and upper Detroit River our first choice for April and early May. By early May the Detroit River water temperature is too warm for the walleyes to spawn which is what pushes them north to the St. Clair River. The St. Clair River is excellent in April. (The Detroit River can be even better in April.) 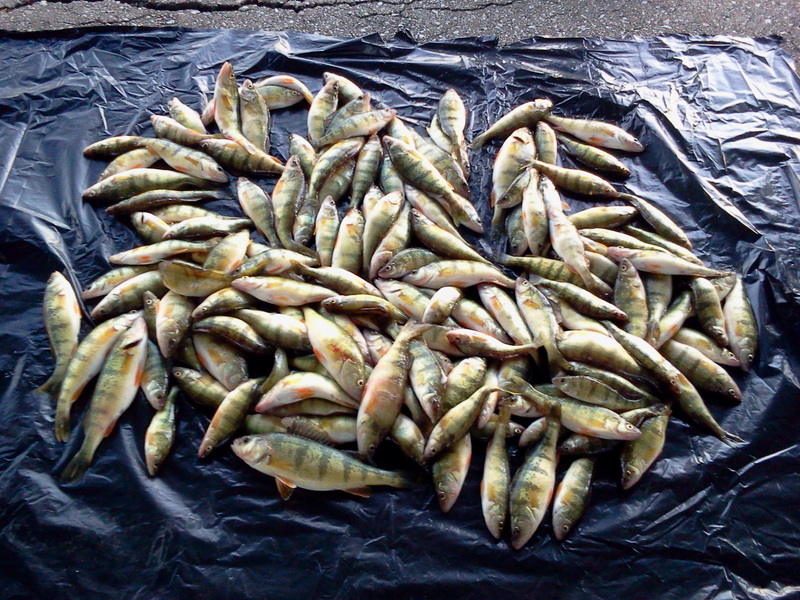 Come May the balance tips to the St. Clair River having the biggest population of walleyes. April, May and June walleye fishing on the St. Clair River is outstanding. Many groups choose the St. Clair River as their preferred destination based on May’s warmer weather. Both the Detroit River and the St. Clair River have world class walleye fishing. Lake Huron has developed into a multi species lake. Steelhead and Atlantic Salmon have been planted in the southern portion of Lake Huron for several years now. Coho Salmon are being planted again. The Atlantic Salmon are doing well and return to the harbors at Port Sanilac and Lexington in good numbers each fall to spawn. 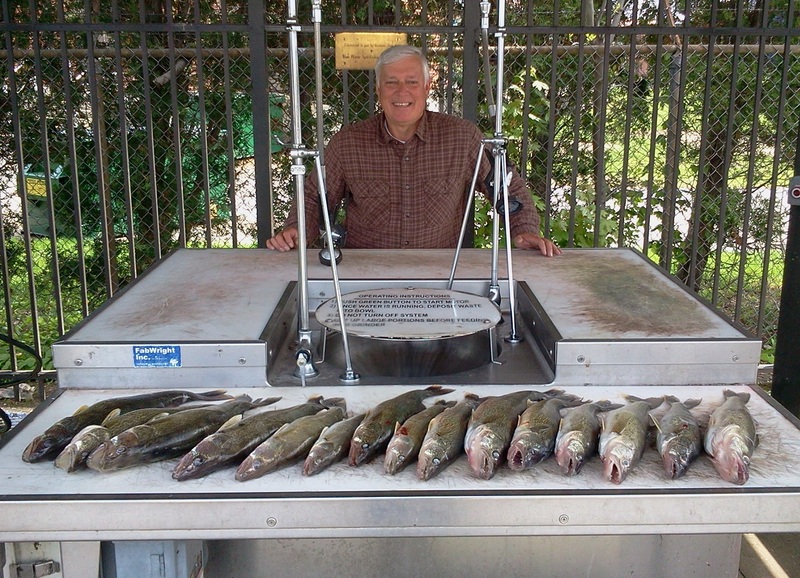 The Steelhead and Lake Trout fishing has been strong for quite some time now. Coho Salmon and King Salmon are planted by Ontario and add to our catch. The Atlantic Salmon are long lived like Steelhead and will return for several years to spawn each fall. During the spring, summer and fall Atlantic Salmon are caught along with Steelhead, Coho Salmon, King Salmon and Lake Trout. 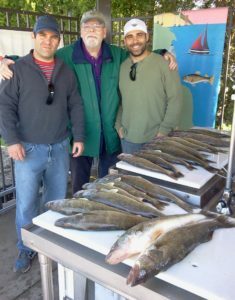 Additionally, with the Walleye population throughout the system at an all-time record high, southern Lake Huron Walleye fishing has been getting better every year. Lake Huron gets deep quickly as we travel offshore. This is a huge advantage over many other ports where much longer distances need to be traveled before lines can be set to catch the types of fish we are targeting. Whether we are fishing for walleyes in warmer water or salmon and trout in colder water we never have to travel offshore very far to find the water temperature the various species prefer. This allows for more fishing time and less travel time on each fishing charter. Lake St. Clair is regularly listed among the top 10 lakes in the nation for small mouth bass and has received the title of #1 small bass lake several times in the last decade. This is world class fishing. 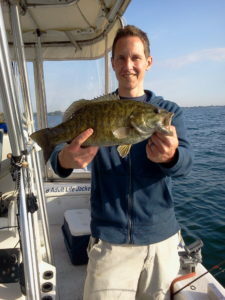 Lake St. Clair has an abundant food web for bass. Having an average depth of around 17 feet and an abundance of patchy weed beds for cover, bass grow fat feeding on a wide range of food items. While minnows, perch and other small fish comprise the bulk of their diet for part of the season, soft shell crayfish are the bulk of their diet at others times during the year. Prior to the fish fly hatch the aquatic fish fly larva (the wiggler) is an added feast. Summer fishing for bass is usually the best with June standing out as a prime time. Most years’ small mouth bass are still in “bedding” areas with eight to twelve feet of water depth during June. While bass fishing is good throughout the summer, we prefer June and early July for bass fishing on Lake St. Clair. 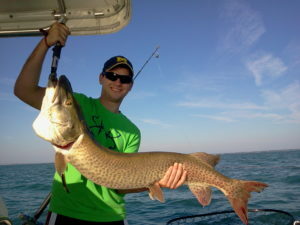 Lake St. Clair is known around the country as the “go to” place for Great Lakes Musky. Over the years the minimum size has been increased so that now a legal size musky is also a Master Angler fish. The population of musky has also increased dramatically. Each year many of the fish caught are not only Master Angler size they also exceed that coveted once in a lifetime category of 50″ and over. This is truly trophy fishing. The season is long. Musky are caught throughout the spring, summer and fall. Trolling is the preferred technique, which, day in day out puts more fish on the line than other techniques. We set lines using multiple types of bait and presentations typically running eight to ten rods at a time to maximize success. Rods, reels bait and tackle are included at no additional charge. We offer musky trips starting with our standard half day trip and increasing to full day trips or longer for those people on a mission to catch that fish of a lifetime. 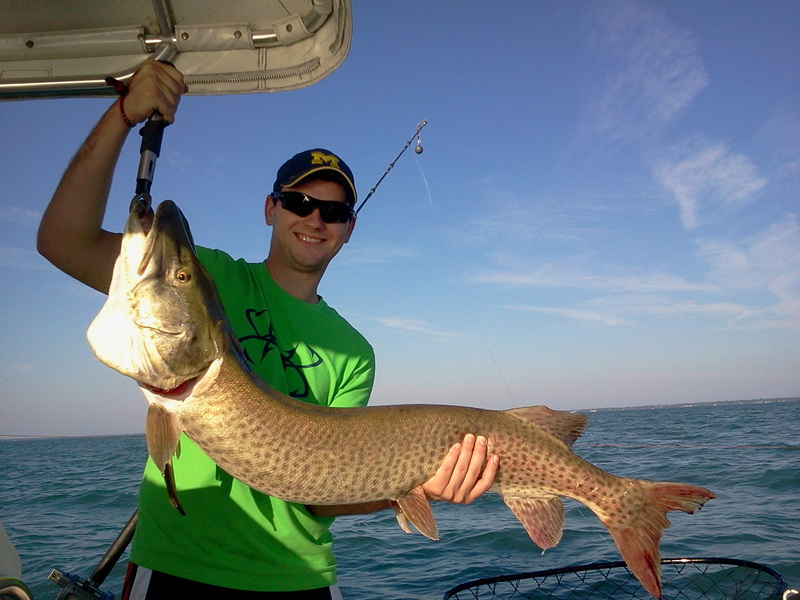 We will typically fish Michigan and Ontario waters of Lake St. Clair for musky based on the fishing licenses your group brings. Once your charter date is confirmed we send you a license and information page with links for Michigan and Ontario fishing licenses, along with additional charter information. Please call to check available dates and to reserve your musky charter. 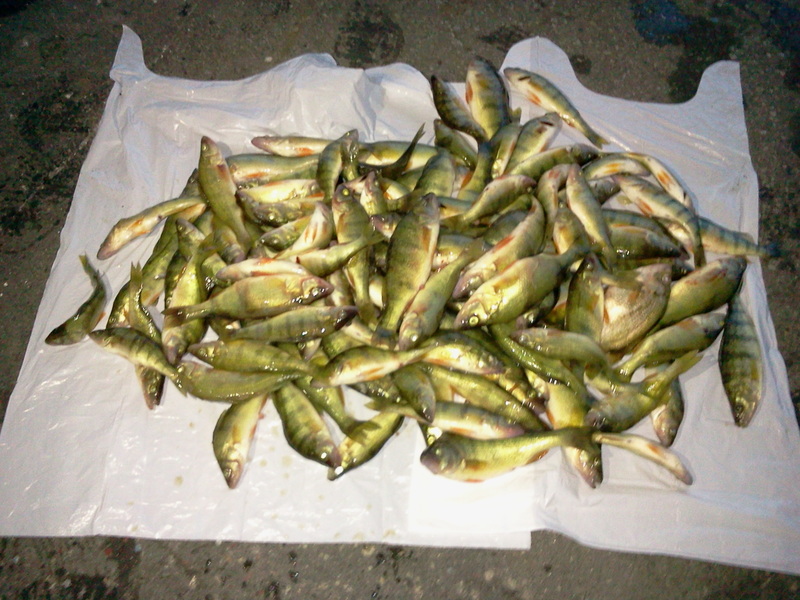 Lake St. Clair has an average depth of around 17 feet and an abundance of patchy weed beds throughout its’ 400+ square miles of surface area which provide outstanding conditions for a widely distributed perch population. Perch school more heavily at certain times of the year based on what food is available to them and water temperature. While minnows comprise the bulk of their diet for parts of the year, soft shell crayfish are the bulk of their diet at others times during the year. Prior to the fish fly hatch the aquatic fish fly larva (the wiggler) is a feast upon which they gorge themselves. Summer fishing for perch is usually good but you may not be as selective on size if you want to take home an abundant catch. In September the days grow noticeably shorter, the weather and water grow cooler, and the perch fishing gets better and better for bigger perch. 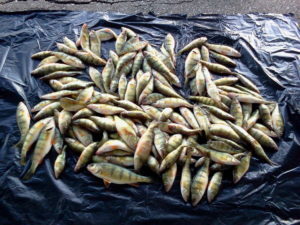 We prefer September and October for perch fishing on Lake St. Clair. Lake St. Clair sees an influx of walleye starting in May and June. 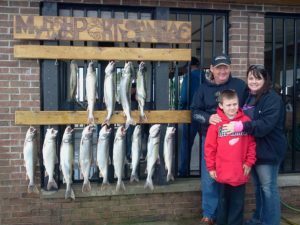 While walleye fishing usually on Lake St. Clair takes second seat to the St. Clair River and Detroit River walleye fishing most of the year, a good push of walleye is typically found on Lake St. Clair in later July and August along the freighter channel that bisects the lake. The walleye fishery expands and changes as spring progresses toward summer. Vast numbers of the walleye that were previously in the Detroit River in April now move between Lake St. Clair and the St. Clair River. 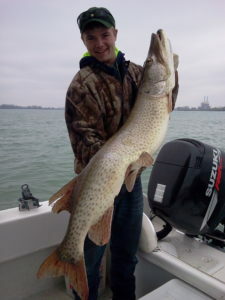 Most days fishing for walleyes on Lake St. Clair will bring a mixed catch which include small mouth bass, perch and the occasional musky or northern pike. In the fall walleye start congregating at the base of Lake St. Clair near the head of the Detroit River. During October walleye fishing rivals the spring walleye fishing but is not fished by nearly as many boats. Trolling or drifting, the techniques of choice for summer walleye fishing, gives way to vertical jigging which is the preferred technique in the fall.